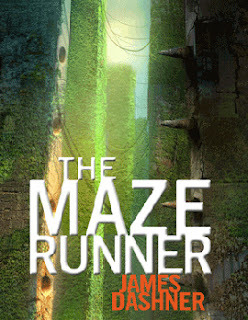 With book three of the Maze Runner series by James Dashner due out in two weeks and Catherine Harwicke signed on to helm the first film in 2013, plenty of people have been tempted to pick up the first book. All that seems to be stopping them are the abundance of mixed reviews about the Maze Runner. It's very much one of those books that readers will love or hate, but not for many of the reasons they rave or rant about. The Maze Runner is surprisingly confined and linear, not unlike the maze itself, which adds both intrigue and irritation to the story of the group of analytical boy survivalists who populate it. From the point of view of Thomas, the protagonist. Everything that happens in the story revolves around Thomas, a teenage boy who wakes up in a dark metal box that is slowly being hoisted, metal grinding against metal, for what feels like hours. His memory, gone. The opening alone is a giveaway. Without the benefit of a protagonist with any memories beyond his first name, readers are not privy to any context except what unfolds around them. Amnesia, forced or otherwise, dots plenty of plot threads, and tends to be effective in helping the author keep any cards close to his chest at the expense of character. Thomas doesn't know what makes him tick, and neither will you. Not for awhile, which is the primary driver for the story that Dashner uses to propel the story forward. It's not unlike a maze, offering up a limited field of view and never knowing what might be around the next corner. The Glade and the Maze beyond it, a puzzle box without answers. There is a bigger world beyond the one where most of the story takes place. But that comes much later. Most of the Maze Runner is confined to a smallish and simple space, with Thomas being freed from the metal box by a group of other teen and preteen boys who have created their own society in a very unsettling environment called the Glade. The Glade is an open space surrounded by tall stone walls with four massive gaps that open into a maze. It's here that the boys, who call themselves Gladers, have developed a makeshift society out of necessity with different groups assigned duties to survive, but not without a supply line. A boy like Thomas, about once a month, isn't the only thing to arrive in box. The boys have learned they can make requests and receive either prefabricated supplies or raw materials. Their duties are straightforward. Some farm. Some herd. Some build. Some clean. And some run the maze. During the day, the maze, with its overgrown ivy walls, isn't much of a bother beyond the possibility of getting lost and not making it back before dark. But at night, it's a different story, as bio-mechanical monsters hunt for anyone foolish enough to do so. The story is straightforward and suspenseful as a forced fast-paced mystery. The Maze Runner reads like a mystery in that it keeps you wanting to look around the next corner, but the story runs at a clipped pace, as if it might all collapse behind you. This leaves very little time to understand many of the characters who suffer tragedies, trials, and tests. And at times, Dashner shortchanges secondary characters by all but ignoring them during some chapters in the book, especially toward the rushed end. You might want to know what is happening with Alby, Newt, Minho, Chuck, or Frypan, but Thomas is too wrapped up in his own head to notice. It can be annoying at times, almost like being locked inside only the foreground of Thomas' head. And yet, at the same time, the story is intriguing enough to overshadow these shortcomings. It's entertaining. 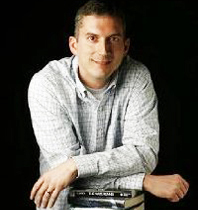 A few spins with James Dashner, author. Dashner isn't shy about his inspiration for the story, at least on the front end. He isn't shy about giving nods to Lord Of The Flies by William Golding or Ender's Game by Orson Scott Card. Just don't expect flashes of their greater complexities inside the Maze Runner. These boys aren't like regular boys, which is why some of their behaviors seem so out of the ordinary. This is the third series written by Dashner, who was previously best known for The 13th Reality series, which is still progressing with Shadow Mountain. The Maze Runner, which was published by Delacorte Books, is meant to be a trilogy. He is a surprisingly down-to-earth author, still wide eyed and filled with some wonderment that people like his stories. He tells everyone that persistence is the key. The Maze Runner By James Dashner Clunks At 4.4 On The Liquid Hip Richter Scale. There is no question that Dashner is an amazing storyteller, someone you can easily delight in as he weaves straightforward stories against brilliantly imaginative environments. It's true enough that it is easy to forgive sometimes shallower characters, linear plots, and clunky writing. At the same time, his books don't pretend for a minute to be something that they are not — they're fantastical entertainment. The Maze Runner (Maze Runner Trilogy, Book 1) is available at Amazon. You can also find the book at Barnes & Noble. The Maze Runner is also on iBooks and the audiobook is available on iTunes. Mark Deakins is perfectly cast as the narrator. He's so good, it would be difficult to hear anyone else complete the series.